PandaTip: The tokens filled in using the menu on the right automatically add key information about your activity, company, and client to this template. Scroll down to review each section before sending the release of liability to your client. I, [Client.FirstName] [Client.LastName] for consideration of participating in [Activity.Name] (Activity) taking place on [Date] hereby release [Company.Name] from any and all liabilities that may occur from injury or loss during this activity. PandaTip: This section of the release of liability template clearly states the participant’s awareness of any rules or guidelines. It also lays out terms for liability for damages or loss. I hereby acknowledge that I have read or otherwise received all rules, warnings, and restrictions related to [Activity.Name]. I hereby certify that I understand the above risks associated with this activity and agree that [Company.Name] shall not be responsible for any injuries or losses sustained by me during [Activity.Name]. Additionally, I agree to be held solely responsible if my negligence, willful misconduct, or disregard for the rules of [Activity.Name] leads to damage to others or to [Company.Name] property. Any legal manners arising from this release of liability shall take place in the state of [Company.State] as agreed. PandaTip: Use the template’s text field (below) to detail any risks specific to the activity being performed. By signing below, I consent that I understand participation in this activity is voluntary, and I am under no obligation or duress to participate. 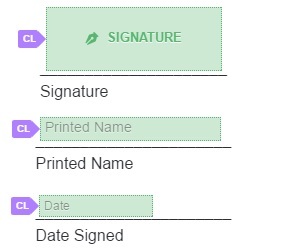 PandaTip: Have your client (or their legal guardian, if the participant is a minor) sign the template below. Using PandaDoc, your clients can sign their release of liability from a computer or mobile device. NOTE: If the participant is a minor, please have their legal guardian sign below.